Our list of best dressed big guys is all about attitude. We don’t care what size and shape you are, we believe you can look terrific and exude strength and individual style whether you are big and tall or short and small. So sit back and relax while we present five guys who define everything it takes to be big, loud and proud. James Gandolfini is an acclaimed actor who has played a variety of roles throughout his long career. But let’s face it, whether he likes it or not, Gandolfini will always be Tony Soprano. Seemingly born to play this larger than life character, James is also a big guy who dresses with style. An unashamedly large built man who can look great in a well-fitted suit or a simple polo shirt. Incorporating the right clothes for his build based on a perfect fit. Most famous for playing the strange and disaster-prone Alan from the Hangover movies, Zach Galifianakis was a veteran of the stand-up scene for years before hitting it big in Hollywood. On screen, Zach is often seen playing the slob who has little care for what he wears, but off-screen he is one seriously sharp dresser with great eye for big man style. At film premieres or snapped on the street, he is always seen wearing sleek suits and quirky casual wear. His eye for style makes this funny man a big mens fashion icon. Skyrocketing to fame playing the awkward high schooler in 2007’s Superbad, Jonah Hill has gone from strength to strength on screen. Last year’s 21 Jump Street and his Academy Award nomination for 2011’s Moneyball has really solidified his status as one of the hottest young actors in Hollywood. While his weight has been fluctuating of late, Jonah is a naturally large-framed guy who isn’t afraid to be super-stylish. His role as the eccentric and outspoken Cameron Tucker on the hit show Modern Family has won him praise around the world, as well as two Emmy Awards. What we like about Eric Stonestreet is his “big and proud” sense of style. On Modern Family he is often seen wearing large size shirts that are not only the perfect fit for his shape, but are also bold and bright coloured. Outside the show though, Stonestreet has proved himself to be quite the snappy dresser, not afraid to sport a killer red-carpet tuxedo. 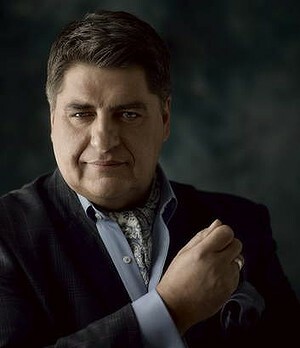 OK, maybe it’s our Aussie bias, but we are going with Matt Preston as our pick for the best dressed big man. His style is undeniable and the sheer audacity of single-handedly bringing the near-forgotten cravat back to our attention deserves some serious praise. Whether he is dishing out his opinions on a perfectly garnished seafood dish, or sprucing his latest book, Preston’s sharp fashion-sense sets him apart from the crowd. Often bold, sometimes brash, but always stylish. Well done Presto. If you are looking to capture some of that big and tall style, why not check out Ron Bennett Big Mens Clothing and give your wardrobe the overhaul you deserve. They have everything you need to satisfy your big men fashion needs no matter what your size and shape.